Tomatoes are definitely an essential ingredient in Spanish cooking. The Spanish enjoy fresh tomatoes many ways—in salads, sliced on French bread or cut in half and eaten like an apple, but with a pinch of salt. They even make cold soup from raw tomatoes. As far as cooked tomatoes, they appear in casseroles, sauces or stuffed with meat or fish. So crazy are Spaniards about tomatoes, that there is a festival called the Tomatina in Buñol, Valencia every year for the last 61 years. It is essentially a HUGE tomato fight in the street. It so popular that 40,000 people throw 110 tons of tomatoes that are provided by the town council. Since tomatoes like full sun and well-watered soil, Spain has a perfect climate for growing tomatoes and produces around 3 million tons a year. Just as canning fruit and vegetables were common tasks for women around the US for many summers, putting up bottles of sofrito, (a mixture of stewed tomatoes, onions, and garlic) is for women in the Spanish countryside. Sofrito is used as the base for sauces, rice dishes and for stews. There are many varieties of tomatoes. Visually you can distinguish between the small cherry tomatoes, the larger round tomato (such as the beefsteak) and the plum or Roma tomatoes, which are oblong. Because tomatoes are harvested when they are still firm, so that they survive transportation to the market, they may be green. 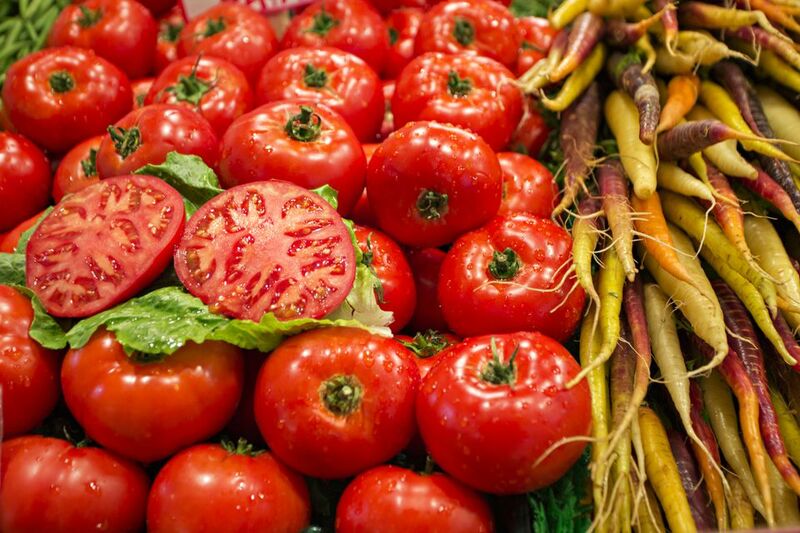 So, lots of tomatoes we see in supermarkets are gassed with ethylene to turn them red. This practice has been in place for several decades. When you choose fresh tomatoes at the store, pick tomatoes that are firm, but give slightly when you press the flesh with a finger. To soften a tomato, take it out of the plastic bag and leave it on the kitchen counter or windowsill for a day or two. If you would prefer vine-ripened tomatoes, you have some alternatives: First, recently some supermarkets have started to carry vine-ripened tomatoes—still on the vine! Second, you could grow tomatoes yourself either in a small garden patch or in a container. If you aren’t going to grow your own, stop by your local farmer’s market and shop for ripe tomatoes. Either way, we predict that you’ll end up with tomatoes that are much more flavorful than what you normally find in the produce section. Any brand of tomato sauce or crushed tomatoes is fine to use. You’ll get to know the flavor of each brand and you’ll learn which ones are more or less acidic than others. The acidity of a sauce is good to know since it affects how your final result tastes. If a recipe calls for fresh tomatoes and you do not have any on hand, you can usually substitute crushed canned tomatoes if you are making a casserole or a sauce where it will be cooked or simmered.